This is not only a beautiful Antique recast medal, it comes with a MIRACULOUS HISTORY behind it (read below)! This Antique medal recast is from Spain during the 1800's. It is a solid piece and is approx. 2 1/4" in length. ANTIQUE BRONZE CARAVACA CRUCIFIX comes packaged with a free Holy Card. This is "The Cross of Miracles" according to many! In the year 1232, a miracle occurred in the Spanish town of Caravaca de la Cruz. A missionary priest named Don Gínes Pérez Chirinos de Cuenca was captured and taken before the Muslim king who was curious about "the Mass". He wanted him to demonstrate the procedure. He refused at first, but finally agreed. The king arranged for the necessary items: an altar draped with a pall cloth, bread and wine, and some candles. However, a crucifix was missing. The priest explained that the presence of a crucifix was critical to the Mass and he could not continue without one. No sooner had he spoken these words than the chamber was flooded brilliant light and two angels appeared, bearing a 2-armed cross, the Vera Cruz of Caravaca, containing wood from the true cross of Jesus Christ! News of this Miraculous Crucifix spread and it gained a reputation as a powerful protector and healer in the centuries to come. The miracles didn't stop there: Eventually, the town passed to the Knights Templar who, in the 15th century, built the castle that still dominates the town today. At one time, the Knights Templar and townsfolk were under siege by the Muslim army and took refuge in the castle. It wasn't long before the water stored in the castle became unpotable and several of the refugees became ill. Scouts crept out of the castle at night to look for water but found the neighbouring wells had been poisoned. In desperation, the scouts raced out of the castle on horses to find a safe source of water. They found some wine, loaded the wineskins on their horses and raced back to the castle. 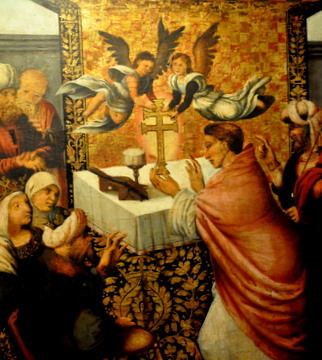 The wine was blessed in the presence the Caravaca Cross and served to those who had been debilitated by the bad water. They recovered immediately and the blessed wine was mixed with the toxic water in the storage tanks. The water became fresh and as a result, the Christians were able to resist the enemy! Today, an annual fiesta is held in the town to remember those events, which includes a ceremony to bless the irrigation water used by Caravaca farmers. Because of these miracles and the relic of the True Cross, in 1998 Caravaca de la Cruz became the fifth holy town celebrating the Perpetual Jubilee in the Vera Cruz Sanctuary where the Caravaca Cross is kept. Also of Note: Franciscan monks travelled to the Americas, taking copies of the Caravaca cross with them. This cross is also used by archbishops and patriarchs. This crucifix is still popular in Central and South American churches and monasteries.